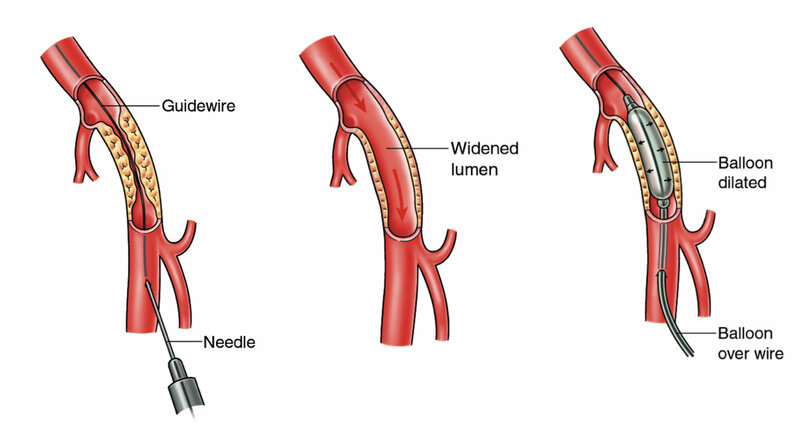 Angiography is the imaging of blood vessels using contrast media/x-ray dye injected into the bloodstream of the arteries so the vessels can be viewed using x-ray (fluoroscopy). 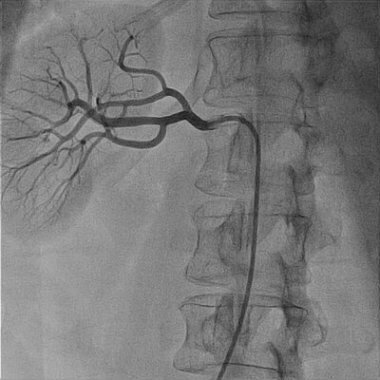 Renal angiography is the study of the blood vessels to the kidneys. Angioplasty is the technique of mechanically widening narrowed or obstructed arteries. This is done by putting a guide wire with a collapsed balloon on it, into the narrowed location and then inflating the balloon. The balloon forces expansion of the plaque deposits and surrounding muscle wall, opening up the blood vessel and thereby improving blood flow. A stent (a fine mesh stainless steel tube) may be inserted at the same time as ballooning, which helps to ensure the narrowing remains open. A renal angiogram is an x-ray study of the blood vessels leading to the kidneys and is done to assess the blood flow to the kidneys. X-rays (cine films) are taken as contrast dye is injected into a catheter (a tiny plastic tube) that has been placed into the blood vessels of the kidneys. The specialist then assesses the cine for any narrowings or other abnormalities affecting the blood supply to the kidneys. If a narrowing is found, the doctor may treat the affected area with a vascular balloon (PTA or percutaneous transluminal angioplasty) or even place a stent in the affected area.